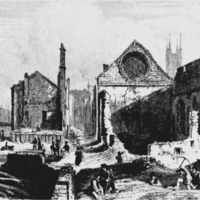 Pictured here is an image of the Winchester Palace ruins after the fire of 1814. The fire revealed many medieval remains of the palace that were hidden during industrialization in the seventeenth and eighteenth centuries. This fire set a precedent for future excavations and has aided historians and archaeologists in medieval studies of Southwark. Most prominently displayed in this image is the west wall, which holds the rose window, and is still standing today. It appears that we are looking at this scene from the west and can see the London Bridge in the background connecting the north and south banks of the Thames. London City Council, “Winchester Palace (the ruins in 1814),” Medieval London, accessed April 22, 2019, http://medievallondon.ace.fordham.edu/items/show/138.